One of the best illustrations I’ve heard for building wealth on solid principles comes from a book called Financial Fitness. In it, the authors recommend you follow an investment hierarchy shaped like a pyramid, where the bottom represents what you do first and the top represents what you do last after all other steps are completed. While people might argue with the order of some of their levels, the concept is sound. The first layer is all about investing in yourself and always saving a portion of what you make—ALWAYS! Sir John Templeton, whose savings and investment strategies earned him over 1 Billion dollars in net worth and made him one of the world’s top 150 wealthiest people said, “The great majority of people do not build up any wealth because they do not practice the self-discipline of saving some of their income every month.” I believe he’s wrong on one thing, relying on self-discipline to save every month will ensure you don’t save every month. Instead, you must make it an automatic habit so that there is no temptation to skip a month or rob from that savings. The problem is people try to will themselves to save every month, but they end up skipping when other “priorities” come up because their willpower happens to be low. But let’s return to Mr. Templeton for a minute. Because he followed this principle, he actually had some cash on hand when the Great Depression hit in the 1930s. With that cash, he went and bought 100 shares of EACH stock trading on the NY Stock Exchange (they were all trading for under 1 dollar/share at the time). Later when the economy came roaring back he made a killing. Really though he just prepared, saved money and let time build value for him. Let me return to the pyramid analogy for a minute. 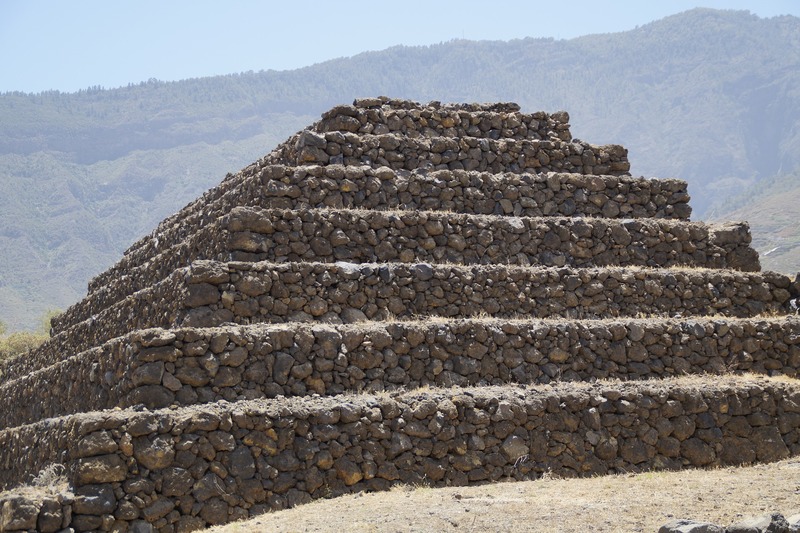 Think of the sheer volume of stone in the first level of this pyramid to the right compared to the volume of stone in the top level that is missing. If you have a great foundation of knowledge (investing in yourself) and cash reserves (rainy day funds, emergency funds and safe cash investments), then when the hard times hit you are not only insulated but you are prepared to take advantage of the financial fire sales that will be available to you at the time. The problem is that most people spend all their disposable income on liabilities (things that depreciate and charge interest, etc. ), entertainment and pleasure, and hope to get rich with other people’s money. While someone might get lucky from time to time with this scheme, they will live a life of boom and bust because they haven’t developed the habit of building a solid foundation. That approach looks like this image to the left. Even if the get rich quick scheme works tem porarily, the pyramid falls with the first financial tremor or windstorm hits. Sir Templeton may not have got rich in a minute but a decade was relatively quick and he got to maintain it and grow it for the rest of his life because the foundation was right. So make the move today and start building that base level thick and deep by saving every month so when you decide to venture into the potentially higher return areas you will sleep well at night resting on that solid foundation. How to Increase Financial Offense! My father hungered for knowledge and he wanted to know truth. I suppose it’s from his example that I learned to love books because I certainly didn’t come by it naturally. No as a boy I was more likely to be climbing trees and jumping over everything I could (this sometimes ended in disaster or humor) than sitting still long enough to listen let alone read. Give me a ball and an open space and I invented a game that kept me occupied for hours. So with that image in mind picture that boy trying to sit still while my Dad read the Power of Positive Thinking or some other insightful composition. It was a struggle, to say the least, and much to his chagrin, I ended up in a remedial reading class in 7th grade. That was a turning point for two reasons. First, it forced me to see where I really was vs. where I thought I was (self-deception). Second, it introduced me to one of my first coaches in life outside of my family. Mr. Jack Harris, who taught that remedial reading course, took me aside one day and said, “Richard you don’t belong here, you need to tap into your potential” I believed him and he helped me decide it was time to grasp what my father felt about books. Not long after this, my Dad convinced me to read a book by Vince Lombardi, the famous Green Bay Packer football coach. He figured he’d trick me with my love of sports and watching NFL football was one of my favorite pastimes back then. Something happened while I read that powerful illustration of a man who coached with boldness and conviction. I recognized that great achievement was demanding and that true leadership made a difference when they held the standard high. In the case of taking over the losing Green Bay Packer team, Lombardi set the tone right away, emphatically declaring to his new team that he’d never been associated with losers and he didn’t intend to start now. He turned that program into a dynasty. I’d like to say I immediately grabbed the habit of reading after finishing that book but I didn’t. It took time and effort, but that same desire to learn, grow and progress that my father had burns inside of me and I love reading today. I can’t get enough because I have learned that I can glean wisdom from the ages and I can pick up the habits and epiphanies from lifetime pursuits through books and instructional audios. This habit sets high achievers apart from the rest and it definitely correlates to winning financially and in every area of life. I’d like to say I immediately grabbed the habit of reading after finishing that book but I didn’t. It took time and effort, but that same desire to learn, grow and progress that my father had burns inside of me and I love reading today. I can’t get enough because I have learned that I can glean wisdom from the ages and I can pick up the habits and epiphanies from great leaders through books. This habit sets high achievers apart from the rest and it definitely correlates to winning financially. Let me give you a personal example from high school. As I started competing seriously in track and struggled to win a big event, my Dad decided to hand me, you guessed it, another book. This book was on the practical application of visualization in sports and how to mentally create and recreate your victory over and over again. I remember putting on music every night and picturing every aspect of my next 800-meter run. I can still remember lining up in Tad Gormley Olympic Trial Stadium in New Orleans Louisiana and thinking as I looked at the other runners, “good luck fighting for second because I am finishing first.” It wasn’t cocky or arrogant, it was conviction. I had seen it! This concept gave me one of my first victories on a bigger stage because of knowledge I gained from a book. Don’t try to get the habit of reading simply by telling yourself it’s important. Set aside a time, a location and the book and do it daily even if it’s only for 5 minutes at first. Make it automatic so it can become a true habit. Leaving it up to “will-power” at random intervals won’t work! Use the visualization technique I just described to see yourself as a reader. Apply these two tips and you are on your way to a healthier mind and stronger finances! Millions each year join the daily throngs of people who willingly unload their wallets so they and their children can enjoy a brief encounter with Mickey Mouse and the gang in the land of enchantment. Visiting Disneyland or Disney World for the average American family has almost become a pilgrimage that must be completed at least once in a life time. Amazingly, the allure that pulls people into these gates like a mosquito to a bug light can all be traced back to the VISION of one man—Mr. Walt Disney himself. Sure there were many collaborators who made the project possible, but with out the dreamer—the “Visioneer” if you will, a collection of talent and resources never comes together to create the physical reality. In Walt’s case, his vision for a Disneyland on the East Coast was all he provided because he passed away before the project was completed. Mike Vance, the man in charge of the Development of Disney World, while giving a tour of the recently completed park overheard someone say, “Isn’t it too bad Walt Disney didn’t live to see this?” To which Vance quickly replied: “He did see it—that’s why its here!” (bringing out the best…p 166). With out belief, or put another way a mental creation, the physical creation isn’t even possible. To lead or succeed then, one must create a dream that is so vivid, so real that when he or she opens their mouth that dreams spill out in such a fashion that it compels others to not only see it, but feel it. Benjamin Franklin was one such visionary who developed the art of persuasion through dream sharing. His belief or vision capacity coupled with leveraging the power of daily habits made him one of the most influential American Founders. For example, many don’t know that nearly 30 years before the Revolutionary War Franklin helped organize a local militia group in Pennsylvania. In 1747 Spain and France were hostile to England and sent privateer ships over to America where they sailed up the Delaware River near Philadelphia, Franklin’s home town. The privateers successfully plundered two farms and made off with an American ship. Franklin, while acting as clerk of the House of Representatives for the province of PA, had witnessed many failed attempts by the Governor of this province to obtain legislation to provide for a colonial militia and thus the colony was defenseless. Franklin, however, was determined to see to it that his community was protected. With the Quakers in the area preaching that war was unlawful and the legislator not willing to act, Franklin took matters into his own hands. Everyone could see the need for protection, but Franklin could see a successful out come in his mind. Where others excused themselves with words like, “if the Governor can’t do it how can I,” Franklin saw possibilities and his compelling vision drove him to take meaningful action and rally his community to do the same. Using his skill of communication he wrote a powerful pamphlet wherein he expressed his vision and promised action. Soon he was casting his vision to a small group, then larger groups and his proposal was ultimately signed by thousands. Eventually, his firm belief rallied some ten thousand men to volunteer. They brought their own arms, formed into companies and regiments, chose their own officers and began meeting weekly to learn the art of military discipline and procedure. Whether it’s Franklin’s vision that organized a community into a volunteer militia or Walt Disney’s vision that assembled his team of “Imagineers” to create an unparalleled family vacation destination, they both supplied a clear and compelling vision and continued to believe and inspire belief no matter the obstacles that loomed before them. The fact that it hadn’t been done before was irrelevant because they could see it almost as if it already existed and their enthusiasm and conviction helped others buy in as well. In the end, they moved people and people moved the vision into reality. Free people see freedom clearly and project that vision around them just like Franklin did. Unfortunately, too many today are fixated on all the problems that surround us. From government, the economy to their personal problems they are continually casting a dark cloud of fear, failure, hopelessness, and subservience. Before you spout the woes of your current frustrations, ask yourself if Franklin’s vision built a fort what does a negative vision build? Too many today are overly focused on a loss of freedom or their financial frustrations, their struggling business or job and thus their freedoms decline. So if you would truly live free ask yourself what are you continually visualizing or dreaming about? Is it compelling you and others to positive action or fearful destruction? Free people remain free and flourish because of belief in a bright new future. What are you selling yourself and others? How Much is the Decision to Quit vs Commit Costing You? Hell’s Kitchen, New York City – 1946: An infant, born in a charity ward entered the world screaming about more than the usual pain of the birth canal. Complications arose during labor and a young inexperienced intern improperly used the metal forceps to extract the baby, thereby severing a facial nerve which gave Michael Sylvester Gardenzio Stallone a saggy faced scowl he’d wear throughout life. While this trademark look would later serve him well in tough guy roles in the movies, it first proved to be a stumbling block in his journey to fame and fortune. You see no one is born a star, especially not a poor, droopy faced son of a stern authoritative Italian Immigrant. And certainly not a boy whose mother left them when he was 11, or a kid who attended 13 schools in 12 years due to his academic track record of expulsion and non-conformity. Discouragement pounded Stallone at every turn and opposition seemed to scream at him to “give up, stay down and settle.” But there was another voice; the voice of possibility that quietly yet resolutely countered each blow with, “what if”. Somehow this disadvantaged youth was able to lock into that voice and fight off critics, circumstances, setbacks and even massive financial frustration. His dreams came alive while watching movies where he found escape, possibility, heroism, courage and ultimately inspiration. After watching the 1958 movie Hercules as a boy, Stallone was inspired not just to begin working out to build his physical body, but also to focus on personal development to sharpen his mind. He began dreaming of a time when his acting would encourage millions to overcome their challenges. In order to achieve that dream, Stallone went to Switzerland in order to attend college. There he did some acting before returning to the US without completing his degree. For years he pursued an acting career, claiming to have been rejected by or thrown out of over 1,000 offices. He was told, “that he would never act.” They called him “dopey looking or stupid looking.” In all, he stood down a verbal onslaught that would have convinced millions of others to give up on the dream, but for Stallone, this extra long plateau of rejection steeled his resolve to focus intently on the prize instead of the pain he was going through. At one point he arrived at an agent’s office at 4 pm and was not admitted to see the man so he stayed all night waiting for his return in the morning. The agent was moved by his persistence and found him a role as a thug, stating that “people would enjoy seeing someone like him beat up in a movie.” Small jobs and parts followed, but it was a far cry from success and it certainly wasn’t paying the bills. He was literally a starving actor, a failure who he couldn’t pay the heat during a cold NY winter. His wife pleaded and nagged him, “please just get a job.” But he refused, knowing that doing so would rob him of his hunger, lulling him down a path of complacency and stifled dreams. On a frigid winter day, he left his cold apartment for the public library not to satisfy his hunger to learn, but simply to get warm. While there he picked up a biography about Edgar Allen Poe and it stirred something inside of him. He recalls that Poe’s struggle inspired him to look away from his own problems for a time and pour his energy into becoming a writer. And so he wrote his first screen play which after some time he was able to sell for $ 100. The money didn’t last long, but he kept his dream alive by selling his wife’s jewelry which drove a bigger wedge between them. (In an interview he joked that it was not a good idea). Finally, on the verge of ruin, he sold his best friend, a dog named Butkus, because he couldn’t even afford to feed him. He recalls weeping that day with pain, self-doubt, and discouragement…perhaps this impossible dream was just too much. Shortly after sinking so low, he recalls watching a Mohamed Ali vs Chuck Wepner Heavy Weight Boxing Match and he stood in awe of this outclassed, slow and lumbering man who took blow after vicious blow from the great Ali but refused to go down. In fact, to everyone’s amazement, in the 9th round, Wepner landed a vicious body blow that knocked the champion to the ground. An enraged Ali then pounded Wepner for 6 more rounds. Wepner with dogged determination hung with the exhausted champ all the way into the 15th round. That night Rocky Balboa was conceived in the mind of Stallone and his life’s ambitions and story were personified in the embodiment of a fighter. He stayed up 20 hours straight and with in three days wrote the entire screen play for Rocky. Exhilarated by his creation, he went to work to sell it, but again found nothing but rejection. They called it “sappy and predictable,” words he later repeated at the Oscars when Rocky would eventually win Best Picture. But, the story doesn’t end there. Perseverance paid off when he finally found a buyer who offered him $ 20,000 for rights to the screen play. When he told the buyer that the purchase was conditional upon him acting the role of Rocky they refused to even consider it. Still resolute he walked away, denying himself the short term financial relief he so desperately needed. Soon he was back at the negotiating table and this time they offered him $ 80,000 if he would not act in it and still he refused. When Robert Redford showed interest in the part they came back with an offer of first $ 200,000 then $ 300,000 and eventually $ 360,000. Imagine it, your whole life you’ve been knocked around, told you couldn’t, you’re broke, discouraged and so desperate you sold your own dog… certainly, all of this would justify claiming a victory and using that $ 360,000 to eliminate the financial and emotional suffering you’ve endured. Stallone knew this could set him up, but his dream to act and inspire burned brighter than a one time gain and so with conviction, he told them he would never sell it if he wasn’t cast in the role of Rocky. For those of you who may not be Rocky fans, not only did that film go on to win an Oscar and Golden Globe Award for Best Picture, Stallone was nominated for an Oscar for Best Leading Actor as well. To date, the Rocky Franchise has brought in well over 1 Billion dollars. Rocky apparently hit a home run, but very few people ever take the time to consider the back story and grasp the reality of the success cycle; or imagine if he would have sold out on his dream at any point by dropping down in the comfort zone instead of staying in “unsafe” zone as he put it. I for one would have missed out on the feeling I get when one of those films pumps me up and makes me want to fight for my dreams and realize that with each setback this seemingly never ending plateau will eventually turn into the next big rapid burst of success on my way to bigger dreams! And it will for you too! By the way, the original Rocky film brought in over $ 220,000,000 and Stallone’s cut was let’s just say a little bit bigger than the $ 300,000 he was more than justified in taking. However, I believe if he would have Rocky would have been a one hit movie starred by Burt Reynolds or Robert Redford…Knowing what we know today, that just would have been a disaster. They certainly couldn’t have played the role of Rocky like Stallone…and of course not. For it was his story he was passionately portraying, not theirs. Now, the only question is will you stay in the game long enough to enjoy your big break or will you fall victim to the masses and slip into the comfort zone or just getting by. Whether its financial victory or something else, your big turning point is just over the next horizon. Hang in there!! Increase Your Income by Improving Your Communication Capacity! From tragedy and failure bloom life’s greatest breakthroughs. It begins with that small resounding voice of courage that penetrates our core and releases our true potential or purpose. It’s the spark that illuminates a leader’s vision and demands a call to action. So it was for Jan C. Scruggs when left the theater after watching the 1979 Film, The Deer Hunter. Painful emotions, he’d tried to forget from his days in the Vietnam War exploded inside, leaving him as disoriented as if he had just been hit by the concussion of an actual mortar shell. He flashed back to his first harrowing nights in the muggy Vietnam jungle at age 18. Heavy machine gun fire burst from the trees as N. Vietnamese troops had his squad pinned down. They barely escaped because of the bravery of a comrade who purposefully drew fire in his direction. Finally, his thoughts rested on that day on May 28th, 1969 when an explosion ripped through his patrol, killing or wounding over half of the men. He recalled the screams, the blood the carnage and his own wounds. After his tour ended he found himself back in his small town in Maryland. Memories of the devastation of war haunted him at nights while bitter anti-war sentiment from politicians, protesters and public opinion plagued him by day. People, who knew him growing up, booed him while wearing the uniform in his own town. In the face of this loneliness and pain he had to choose his reaction. He eventually pulled himself together and courageously took steps towards a productive life, starting with community college, then on to American University in DC where he secured a master’s degree in psychology and counseling. During this time he researched war-induced post-traumatic stress disorder and began formulating ideas on the importance of acknowledging veterans sacrifice and contribution as part of their healing. With the film and these events still racing through his mind a decade after returning from the War, sleep evaded him as vivid war images flooded his mind. He found that he wasn’t alone, the movie had opened wounds all across the country as evidenced by ex-soldiers lighting up suicide hotlines nationwide. These events ignited the fuel building up in Scruggs and a powerful vision to build a memorial to the Vietnam War dead burst into view. It was not to be a memorial to glorify the war or to make a political statement, it was to be a symbol of healing —a monument designed for remembrance. Immediately his dream met fierce opposition after publicizing his intentions. The critics, among them many veterans and even powerful members of Congress, venomously declared why the nation wouldn’t support any appropriations for such a project. However, one veteran, a lawyer named Robert Doubek stepped forward and offered his assistance. With his help and Scruggs own money, they founded a nonprofit organization. On May 28th, 1979 Scruggs held a press conference and delivered an inspirational message that rippled across the country. Letters of support rolled in from grieving parents, bitter and hopeful veterans alike as well as children who had lost parents in the war. Total donations fell far short of the projected cost, but momentum was on their side as an army of volunteers rallied to the cause. In 1980 Congress passed a bill setting aside land near the Lincoln memorial for the project, placing a 5 year deadline on raising the funds. Scruggs didn’t wait 5 years, he set his own goal for Veterans day of 1982. Jan Scruggs had a dream, a courageous breakthrough that he turned into action, an action which drew severe criticism, but also healing for himself and millions of grieving individuals. I’ve been to that Memorial and met personally with many Vietnam Veterans as a part of the legislative research work I performed for a decade. I was deeply moved by both experiences. Jan Scruggs had a breakthrough and you’ve had them too. Perhaps, you’ve experienced the devastation of war up close and personal, perhaps your battlefield was growing up in an abusive and divisive home. For some there were foster homes, abandonment, loss, heartache, tragedy, complacency, ease and fear. While most may not experience something as dramatic as war the way we respond to adversity defines us for good or ill. The fact is you’ve heard the voices speak to you. One voice thunders, “you’re a loser, no one understands you, you’re not worthy, give up, quit etc.” The other voice, almost imperceptibly at first says, “Stand up, take heart, you have work to do, change the story, reach out and lift someone else, BUILD A MONUMENT!” Your monument may not be a polished stone wall, but your life can be a witness of the power of change, a symbol of hope that others will follow. Jan saw his vision come to fruition and enjoyed healing in the process. You and I have the same opportunity to choose if our memorial will be one of vision & healing or criticism and reeling. It all depends on what voice we listen to. After reading that, are you passionately pursuing something for the sake of the process and not just the profit. The most successful people I know receive significant profit but its the byproduct of the attitude you just read about. I’m loving the path and the hunt I am on. I hope you are too!